This printable Bible lesson would serve well in children’s Sunday School. You could also modify it for children’s church. It teaches about the Day of Pentecost where God gave the gift of the Holy Spirit to the early church.Be sure to note the additional resource links at the end of the lesson for more crafts and activities. Supply List: Wrap a box with a removable lid. Objects to put in the box: heart, 2 flashlights (one without batteries), Bible, Family Picture and something to represent prayer. You might also enjoy this Sunday School Craft for Pentecost . We’ve also created a Pentecost Coloring page based on the image above. We’ve compiled a long list of resources to help you explain Pentecost for Kids. Learning Goal: Students will learn that God’s promised Holy Spirit came and indwelt believers on Pentecost. Learning Indicator: Students will discover answers from reading Scriptures throughout the Bible lesson. Students will be able to recall events and characters from the story by answering review questions. Use the wrapped box to introduce Bible lesson. The items inside the box are to draw students attention to gifts that believers receive from God. Show the class the gift. We all love to receive gifts! Inside this box are gifts that God gives to everyone who believes in the Lord Jesus. Ask volunteer to come and take one thing from the gift box. After each volunteer has taken an item discuss the gift that God has given to believers. Keep the flashlights for last. Heart-It is a gift to know that God loves and comforts His children. Bible-God’s Word is a gift to His children because we find His promises and instructions inside. Family-It is a gift to be a part of God’s family and be able to pray together and help each other. Flashlight-Have students who chose the flashlights stand together. Have them turn on the flashlights. Talk about why one came on and the other did not. Let the students open the flashlight and discover the batteries and the empty flashlight. The flashlight with batteries reminds us of another very important gift that God has given to believers. When we are saved God gives us the gift of the Holy Spirit. He comes and lives in our hearts and gives each of us power to live a life that pleases God. A person who has not been saved has no power to live a life that pleases God. Put the items back in the gift and put the lid on. God kept His promise and He sent the gift of the Holy Spirit on the Day of Pentecost. To help us understand what the Holy Spirit was going to do for all believers let’s look at our Memory Verse for today. (Discuss the meaning of the verse.) Another word for counselor is teacher. God the Holy Spirit would teach believers how to live lives that please God the Father. When believers read God’s Word, the Holy Spirit helps them to understand what they are reading. God speaks to believers through His Word. When we memorize God’s Word, the Holy Spirit brings it to our minds when we need to remember it. The believers gathered together in that room had experienced an amazing event! God kept His Promise and sent the gift of the Holy Spirit! The noise caused the Jews visiting Jerusalem to gather and find out what was going on. Let’s read Acts 2:6-7. These Jewish people that lived in different countries and spoke different languages were confused. Each one of them could hear the believers from Galilee speaking their very own language. Let’s find out what they heard the believers filled with the Holy Spirit saying in their language. Read the last part of Acts 2:11. What they experienced would be similar to us visiting another country where the people do not speak English and we don’t speak their language. If they began to praise God in English so we could understand we would be amazed! Many in the crowd wanted to know what was happening and wanted to know what this meant. Some in the crowd made fun of the believers and said they had been drinking too much wine. Peter was filled with the Holy Spirit and he stood up along with the other eleven apostles. He told the crowd that they were not drunk. It was only 9 o’clock in the morning. He began to explain to the crowd that God’s promise to send the Holy Spirit had happened that very day on the Day of Pentecost. Need More Help? Browse other lessons and activities on our website about the Holy Spirit. You can find additional ideas on Danielle’s Place Crafts for Pentecost and MSS Crafts. 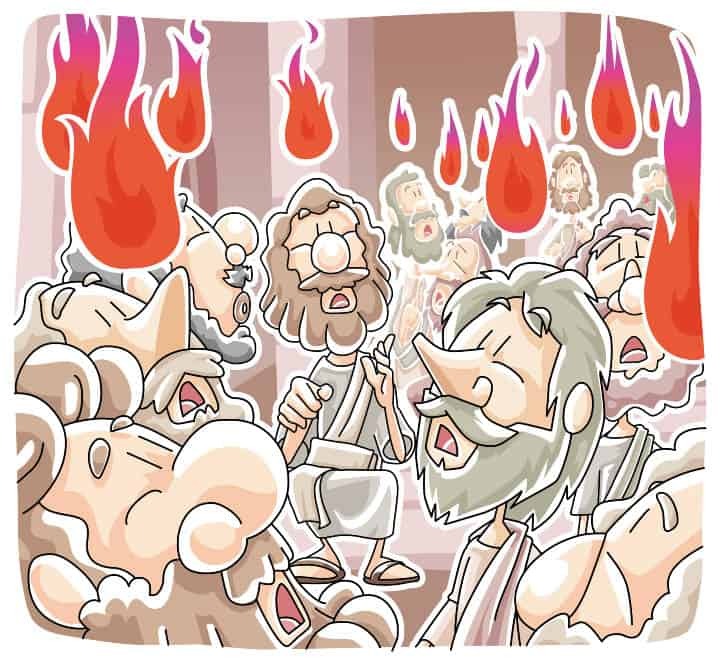 Don’t miss this fun explanation of Pentecost Sunday from What’s in the Bible. thank you so much for making these lesson so readily available to teach to our little ones. you and your staff for the work you provide for Bible school teachers and coordinators like myself. The lessons are not only child friendly; the teachers love the format. We will be using your lessons often at our church. Thank you so much for a great lesson on the Holy Spirit. I can have anywhere from one child to 15 on any given Sunday. I need simply lesson because my students can be 2 years and up to 16 years. I usually have two lessons prepared (one for little ones and the other for older kids), so it can be very challenging for me. My class received the lesson, so much and the short videos were great in helping the kids understand.